We stayed here twice, once for three nights and again for one night coming back thru Phnom Penh. 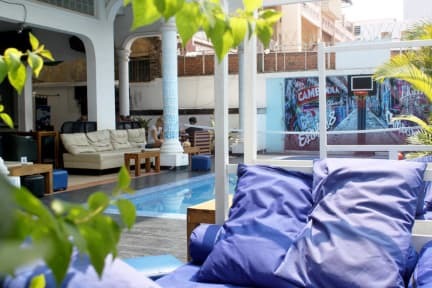 Chill pool area, good food (especially carbonara and fish and chips) at good prices, private rooms are so nice - especially the deluxe private with tea/coffee set and balcony. Front desk staff are really helpful with good English. ATM in the hostel so handy. Would defo recommend! Stayed here for two nights, absolutely loved it ! Great place to hang out with a big pool, pool table and a ping pong table. One of the best hostels I've been to so far. Doors that lock and big lockers in room. Shower could have had better preassure but worked very well for what it was. Staff was very helpful. Hostel offers great food at a good price. Internet works well and so does the aircon. Not a party hostel as, at least when we stayed, there weren't many other people around. But all in all we are very happy with out stay here. Superfriendly and helpfull staff, the reception would arrange your travel to the next place you were headed to and also cheap transport to killing fields, ss21 etc. Not the crazyest party hostel but i guess that also depends on what time of the year you’re there. Can definetly reccomend it. I was a bit confuset by the alleged breakfast buffé for 2$. It was not a buffé, but different meals you could buy for breakfast with the cheapest option starting at 2$. We only stayed here one night so we didn’t get to experience much. But it was a perfect place to stop over if you are taking a giant ibis bus as it is really close to the station. Was only here one night but I enjoyed my stay. They even have a bit of exercise equivalent on the first floor. I would definitely stay here again if I was to return to Phnom Penh. Pros:helpful rec staff: I asked to do some laundry & said washing machine wasn't working, so directed me to the nearest laundrette. Arranged airport pick up for me. Huge lockers. Cons:floors in dorms filthy-My feet got dirty just walking from shower to bed. Drain clogged with hair in the bathroom/toilet/wetroom & nowhere to hang anything in there-had to put my things in the sink. Rock hard beds, curtains disappeared from room & were not replaced. Far away from centre. Food terrible in bar. Receptionist initially short changed us $5 for the room price which we challenged and got back. After this we forgot our key deposit receipt, went back for it and it had been screwed up & their copy was changed from $20 to $10 and fraudulently signed!! The bed sheets were just turned around instead of changed as ours had a stain on one side which ended up being on the other. Drains were blocked up in showers and smelt funny. Pool was cleaned around the edges with sponge. Would not stay here!!!! !